This week I am going to review doubleTwist software. This is a free program to organize and transfer your media from your Mac to a cell phone like a Blackberry. Since I use a Blackberry, this software really piqued my interest. It is possible to move media around, but it’s a pain, because you need to manually resize your movies and photos and then drag them onto the phone’s flash card. doubleTwist makes all of this very easy. It’s simply a matter of point, click, and drag. The software supports a variety of phones including the Blackberry Curve, Pearl, Storm, Bold along with G1, Android, Nokia, Sony, Ericsson, LG, and Motorola. “Browse through your media and play anything. doubleTwist supports all major audio and video formats. 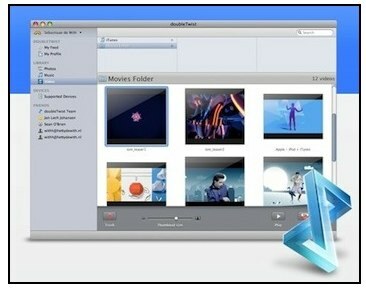 The multimedia software requires an Intel Mac with OSX 10.5 Leopard. The software uses your basic iPhoto-like looking interface. It allows you to move media from Aperture, iPhoto, Lightroom, and the Pictures folder. You can add any folder on your hard drive to the media selection pane. I just plug in my Blackberry Curve via USB, and after it appears in the left pane, I just drag photos, video and music onto the Blackberry icon. doubleTwist sizes down your photos and videos automatically. I couldn’t find any way to customize the sizes. The answer to the big question is NO. It does not remove the copy protection from your protected iTunes music. You’re either going to pay Apple 30 cents extra per track for DRM free music, or figure another way to turn them into an unprotected format like MP3s. doubleTwist, which is now in public beta, also has a web component which makes it a breeze to upload your photographs to Flickr and Facebook. You can also email links to the photos or movies. For now, the web based cloud service, is free to store the media on your doubleTwist account. I did run into a problem when I tried to move an AVI movie file from my iPhoto library. The video looked good on my Blackberry, but had sound problems with only static noise on my audio track. Also, I thought it would be nice if you could eject your device from the interface. I posted my problem and suggestion on the doubleTwist community help forum and received a quick response from the developer. The software is new and it seems like they are happy to take your suggestions and work them into a promising and much needed software. Since doubleTwist is in the developing stages, you may find some minor problems along the way. As a Blackberry user, I’m looking forward to a more polished version to solve my cross-platform multimedia needs.